By simply touching surfaces of common objects and materials, diseases caused by infectious surface-associated microbes can spread through human populations. Such indirect contact-mediated transmission has been documented from mundane objects like food crates, door-knobs, computer keyboards, athletic equipment, and from seemingly innocuous objects in medical settings including beds and tables. The impact of such infections could be further exacerbated in compromised human habitats where effective septic systems and sanitation protocols may be lacking. This presents an important challenge for materials science and provides the focal point for ACT 2. 1) How does the viscoelasticity of coatings affect cell adhesion and proliferation on surfaces? To develop these insights, there are significant challenges, as the microbial cells, complex soft “materials” themselves, also restructure and reform their microenvironment by complex events including secretions of surfactants and polysaccharides, changes of phenotype, and surface-structure mediated interactions with neighbors. The viscoelasticity of the microbes and their structures strongly couple rheologically with the active coating. 2) How does surface texture affect cell adhesion and proliferation? It is well established that surface texture significantly impacts the adhesion and proliferation of mammalian cells, while little is understood about the effect of texture on bacterial cells. Considering that surface textures inspired by the shark skin have led to the fabrication of anti-fouling surfaces, it is highly plausible that textured surfaces could prevent the adhesion of microbes. We leverage the expertise afforded by ACT 1 to investigate the effect of surface roughness on adhesion and proliferation of microbes. 3) What is the effect of hydration on the viscoelasticity and transport properties as well as surface functionality of antimicrobial coatings? Partial hydration, a typical state of the human habitat, can impact otherwise very potent/effective antimicrobial coatings designed for a hydrated environment. For example, partial hydration of polymeric coatings can decrease transport properties and perturb surface chemistry. Development of effective strategies for antimicrobial action in partially hydrated settings by transport of anti-microbial agents, or via contact killing via particle interaction or surface chemistry is critical. 4) How do cells respond phenotypically and adapt to engineered surfaces under relevant conditions? Few studies have shown how the interactions of microbes with surfaces designed to suppress their adhesion, growth and proliferation changes their gene expression. It is clear that bacteria are able to adapt and develop resistances to such stresses. We use microbiology approaches to answer these questions. ACT 2 aims to gain a fundamental understanding of the effects of 1) hydration on the viscoelasticity, transport and surface properties of antimicrobial nanobilayer and layer by layer assemblies, 2) viscoelasticity, surface texture and roughness on microbe adhesion and proliferation and 3) antimicrobial surfaces and stresses on microbe gene expression and a potential mechanism for surface resistance. Burel, Céline. A. S., Ahmed Alsayed, Ludivine Malassis, Christopher B. Murray, Bertrand Donnio, and Rémi Dreyfus. 2017. “Plasmonic-Based Mechanochromic Microcapsules as Strain Sensors.” Small 13 (39): n/a-n/a. https://doi.org/10.1002/smll.201701925. Grady, Martha E., Emmabeth Parrish, Matthew A. Caporizzo, Sarah C. Seeger, Russell J. Composto, and David M. Eckmann. 2017. “Intracellular Nanoparticle Dynamics Affected by Cytoskeletal Integrity.” Soft Matter 13 (9): 1873–80. https://doi.org/10.1039/C6SM02464E. Kim, Dongyeop, Arjun Sengupta, Tagbo H. R. Niepa, Byung-Hoo Lee, Aalim Weljie, Veronica S. Freitas-Blanco, Ramiro M. Murata, Kathleen J. Stebe, Daeyeon Lee, and Hyun Koo. 2017. “Candida Albicans Stimulates Streptococcus Mutans Microcolony Development via Cross-Kingdom Biofilm-Derived Metabolites.” Scientific Reports 7 (January): 41332. https://doi.org/10.1038/srep41332. Lee, Hyun-Su, Carl Myers, Lynette Zaidel, Prathima C. Nalam, Matthew A. Caporizzo, Carlo A. Daep, David M. Eckmann, James G. Masters, and Russell J. Composto. 2017. “Competitive Adsorption of Polyelectrolytes onto and into Pellicle-Coated Hydroxyapatite Investigated by QCM-D and Force Spectroscopy.” ACS Applied Materials & Interfaces 9 (15): 13079–91. https://doi.org/10.1021/acsami.7b02774. Nalam, Prathima C., Hyun-Su Lee, Nupur Bhatt, Robert W. Carpick, David M. Eckmann, and Russell J. Composto. 2017. “Nanomechanics of PH-Responsive, Drug-Loaded, Bilayered Polymer Grafts.” ACS Applied Materials & Interfaces 9 (15): 12936–48. https://doi.org/10.1021/acsami.6b14116. Niepa, Tagbo H. R., Likai Hou, Hongyuan Jiang, Mark Goulian, Hyun Koo, Kathleen J. Stebe, and Daeyeon Lee. 2016. “Microbial Nanoculture as an Artificial Microniche.” Scientific Reports 6 (August): srep30578. https://doi.org/10.1038/srep30578. Niepa, Tagbo H. R., Liana Vaccari, Robert L. Leheny, Mark Goulian, Daeyeon Lee, and Kathleen J. Stebe. 2017. “Films of Bacteria at Interfaces (FBI): Remodeling of Fluid Interfaces by Pseudomonas Aeruginosa.” Scientific Reports 7 (1): 17864. https://doi.org/10.1038/s41598-017-17721-3. Parrish, Emmabeth, Matthew A. Caporizzo, and Russell J. Composto. 2017. 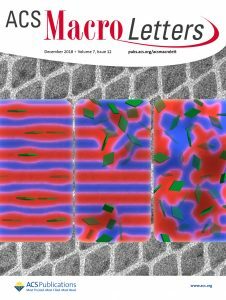 “Network Confinement and Heterogeneity Slows Nanoparticle Diffusion in Polymer Gels.” The Journal of Chemical Physics 146 (20): 203318. https://doi.org/10.1063/1.4978054. Parrish, Emmabeth, Sarah C. Seeger, and Russell J. Composto. 2018. “Temperature-Dependent Nanoparticle Dynamics in Poly(N-Isopropylacrylamide) Gels.” Macromolecules 51 (10): 3597–3607. https://doi.org/10.1021/acs.macromol.8b00335.